The ECHO CS-590 Timber Wolf chainsaw with 20 inch. bar is more powerful than today's ranch and farm saws. It's built for the toughest environments and features easy-starting, easy operation and quick maintenance. Ideal for wood cutting. Powered by a 58V lithium-ion rechargeable battery, the all-new Jonsered CS16i battery-powered chainsaw delivers the power, performance, and runtime typical of traditional gas-powered tools, without the hassle of mixing and storing fuel. Featuring a brushless motor for efficiency, long life, and extended runtime, and instant push-button starting, this quiet, convenient, ergonomically designed, and environmentally friendly chainsaw is easy to start and operate. It also features a substantial 16-inch bar and electronic chain brake with highly visible LED alert so user always knows when chain brake is activated. It's equipped with chain tension assist technology for intuitive indication of too loose or tight chains, and simple chain tensioning. This chainsaw has plenty of power for storm clean-up, trimming, and felling small trees. Powered by an easy-starting 14 amp motor, the Poulan PL1416 electric chainsaw with 16-inch bar is lightweight and features an inline engine design for added balance and control. The convenient, tool-free, side-mounted chain tensioning provides fast, simple adjustments, while the automatic oiler keeps the chain consistently lubricated for less wear, longer engine life, less kick-back, greater cutting performance, and minimal maintenance. This chainsaw is ideal for medium-duty storm clean-up, trimming, and cutting firewood. This PowerSmart Pole Saw is a 6 amp, extending corded electric pole saw with an automatic lubrication system, great for those tough-to-reach jobs or ground work. With a curved motor casing, it puts the blade in a more efficient position to cut limbs. Designed with an ergonomic handle and weighing in at just 11 lbs., this saw provides exceptional maneuverability with the ideal top weight for limb cutting. 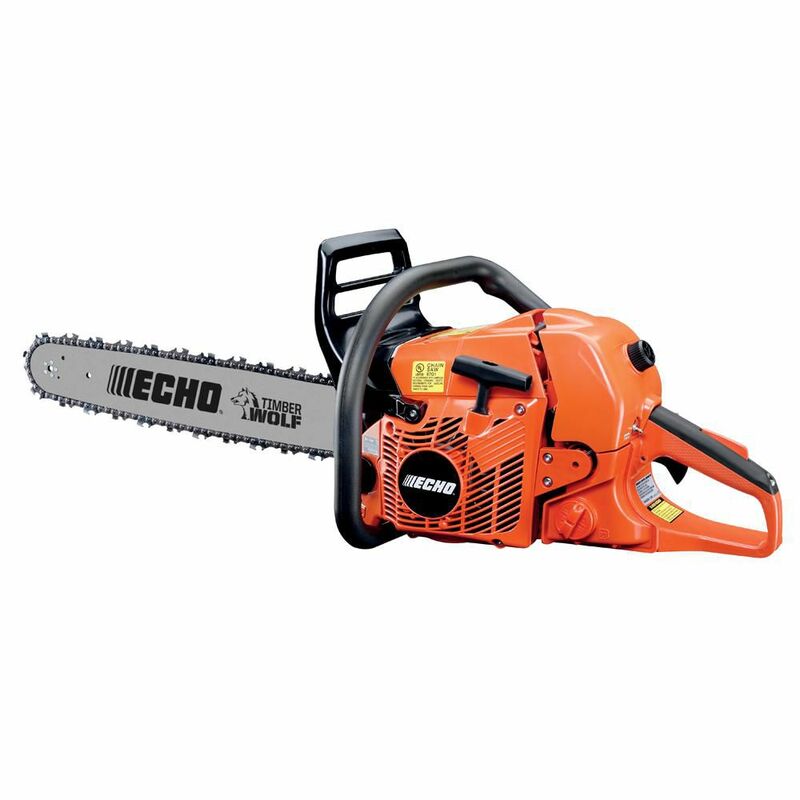 59.8cc Chain Saw 20 inch The ECHO CS-590 Timber Wolf chainsaw with 20 inch. bar is more powerful than today's ranch and farm saws. It's built for the toughest environments and features easy-starting, easy operation and quick maintenance. Ideal for wood cutting. 59.8cc Chain Saw 20 inch is rated 4.3 out of 5 by 4. Rated 5 out of 5 by Chopper from easy to start and use Bought a few weeks ago and the saw has performed very well. easy to assemble, start and adjust. It is light weight and maneuverable. Rated 5 out of 5 by Paverguy from Great saw Just purchased this saw and have bucked up a cord of spruce and a cord of birch. Took 20 pulls to start it the first time, but starts with the most 3 pulls since. Lots of power. Little heavy by the end of a cord of wood but I am very happy with it.